his father Charlie, both played for the Buffanblu and in the NFL. A father and his son are walking toward the Punahou School athletics building on a lazy summer afternoon, talking football. Charlie and Kale Ane, the only father-son combination from Hawaii ever to play in the National Football League, have come full circle. They're not only coaching together for the first time but they're doing it at the school that launched their playing careers. "He's always been there to help me, no questions asked, and his love for Punahou is just as deep as mine," new Buffanblu varsity football coach Kale Ane said about his father and offensive coordinator. "He's a motivator who's great with kids. And I know if I ask him to do something for me, he's going to do more." Charlie Ane, 68, who retired last year after his seventh season as head coach of Maui's St. Anthony High School, jumped at the opportunity when his 46-year-old son asked him to join the Punahou staff. Kale's side when he played for Punahou in 1968. "The most difficult thing is coaching your own son," Charlie said. "The second most difficult thing is remembering (that) my son is the head coach and I'm the assistant. "But mother will always be there to remind me about the second thing," he added, referring to the former Marilyn Blaisdell, Charlie's wife of 48 years and the only woman he says he ever dated. She is the youngest daughter of former Honolulu Mayor Neal Blaisdell. This is actually the second time Kale has asked his father to coach at Punahou. The other time was before his first varsity season as a player. "Father-son situations can be quite difficult to handle because you want your son to do well but you can't show any hint of favoritism," former Punahou coach Dave Eldredge said. "That's why Charlie didn't want to coach Kale." But Charlie changed his mind after Kale asked him to coach. "It was a tough situation," Kale said. "My father was such a dominant player and there was a lot of pressure. "I knew that if he coached me, I needed to do more than the other kids." Unlike his father, who was a powerful athlete gifted with size and skill, Kale was gangly and clumsy. head football coach and assistant, respectively. "When we signed Kale up for Pop Warner in Kailua, the coaches thought that Charlie's son would zip right through," Marilyn Ane said. "But Charlie never pushed his children to be athletes. "So Kale didn't even know what a jockstrap was. The first time he put on (shoulder) pads, he had it on backward around his waist. When he was playing JV at Punahou, Kale was all legs and arms. "At the time, I didn't think football was going to be his game." BUT Kale worked hard and earned a college football scholarship. He was a center, like his father. "For his size, Kale was good," Charlie said. "But it surprised me when he became a college player. "If you look at his personality, he's very calm and cool. But inside, there's a big fire." Both played for major college programs, Charlie at the University of Southern California and Kale at Michigan State. At USC, Charlie played with Frank Gifford, while Arnold Morgado and Jim Nicholson were among Kale's teammates at MSU. The three MSU players from Hawaii all ended up playing together professionally for the Kansas City Chiefs. Charles Ane Jr. -- he prefers the spelling "Charlie" over the "Charley" used during his playing days -- was born and raised in Kapalama. He's the eldest of four brothers -- Gilbert, David and Danny also played at Punahou. "Football was the only sport I didn't get four letters in," Charlie said. 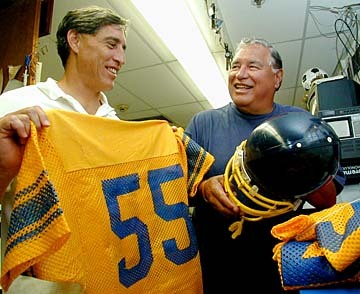 "I never played football until I came to Punahou in 1945. "I started out as a tight end but must have got stupid as I went along because I kept getting closer to the middle. I ended being a center." Ane also played basketball and baseball. His pitching battles with Bill Nishita of St. Louis rank among the best ever in local high school baseball. 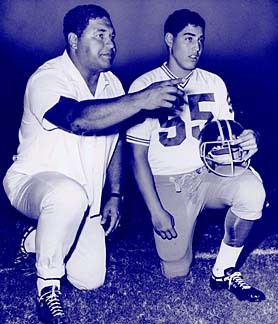 Ane started at either center or right tackle for the Detroit Lions from 1953 to 1959, earning all-pro honors at center. He was a member of Detroit's last NFL championship team in 1957. During his Lions career, Ane played with eight pro football Hall of Famers -- quarterback Bobby Layne, defensive back Jack Christiansen, defensive back/punter Yale Lary, linebacker Joe Schmidt, tackle Luke Creekmur, halfback Doak Walker, fullback John Henry Johnson and center Frank Gatski. played a down for the team. "They only kept 33 players in those days so we had to back up each other," Ane said. "The most I ever made for a season was $17,500 in my last year. "But in those days, you could buy a new Cadillac for three grand. The biggest difference between then and now is football today is a business. In my era, you just came to play." Ane worked in sales during the off-season. HE retired from football and returned to Hawaii in 1960. He had several tours of duty coaching at Punahou with Eldredge and also coached at Radford, Kaimuki and Damien before going to Maui. "My mother always said that you can't just take, you have to give back," he said. "I've been very lucky. My life has been super. "Coaching is my way of giving back and the process of giving has been enjoyable for me." Charles Ane III, better known as Kale, was born the same year Charlie joined the Lions. Kale played with the Kansas City Chiefs from 1975 to 1980 and closed out his NFL career in 1981 with the Green Bay Packers. "Football has given me opportunities," said Kale, who is also Punahou's associate athletics director. "It taught me there's no limits to what I could do. "When I left Punahou, I was also prepared academically and socially. "I never expected to play professionally but ended up playing with people who are in the Hall of Fame like Len Dawson, Willie Lanier, Buck Buchanan and Otis Taylor. "What I learned from them was a work ethic." As a first-year head coach, Kale hopes to make the game fun for his players. "We don't have to win every game to be successful," he says. "For us to be successful, all we want is for our kids to play as well as they can." 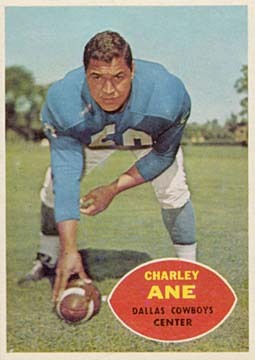 Charlie Ane: Punahou School varsity football offensive coordinator, former head coach of Maui's St. Anthony High School, University of Southern California football player, all-pro player for the Detroit Lions 1953 to 1959. Kale Ane: Punahou School varsity football coach, Michigan State football player, Kansas City Chiefs and Green Bay Packers player. Malia Ane: Outstanding athlete at Punahou. Neal Ane: Outstanding athlete at Punahou. Neal Blaisdell: Former Honolulu mayor, Charlie Ane's father-in-law, star athlete at St. Louis and coach at McKinley and Roosevelt. 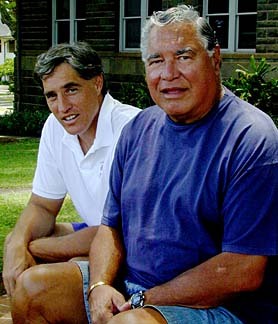 James Clark: A former state senator now living on the Big Island who played for Punahou and the Washington Redskins. He is (Charlie Ane's wife) Marilyn Ane's brother-in-law. Herman Clark Jr.: James Clark's brother and former Chicago Bears lineman. The former Patty Hamilton: Kale Ane's wife, who ran track for Radford and the University of Hawaii.